The castle terraces and rose garden constantly evolve in colour and height as tens of thousands of plants come into bloom from Spring to Autumn. Relax in the calm atmosphere, find ideas and inspiration for your own garden, visit the animals in the park and enjoy the view over the water. For children, the expansive area provides plenty for room for play. Find your own favourite spot for a picnic, or visit the Garden Café with its outdoor seating among the roses. In April, Bosjökloster's park is covered by a white carpet of wood anemones. On the terraces around the castle scores of narcissus and tulips bloom in all colours in May. Mini-shetland ponies, goats, lamas and alpackas roam freely in the park from May until the cold weather sets in. The magnificant Thousand Year Old Oak stands at the entrance to the park. Pause to reflect that it was a young tree during the early days of the convent. 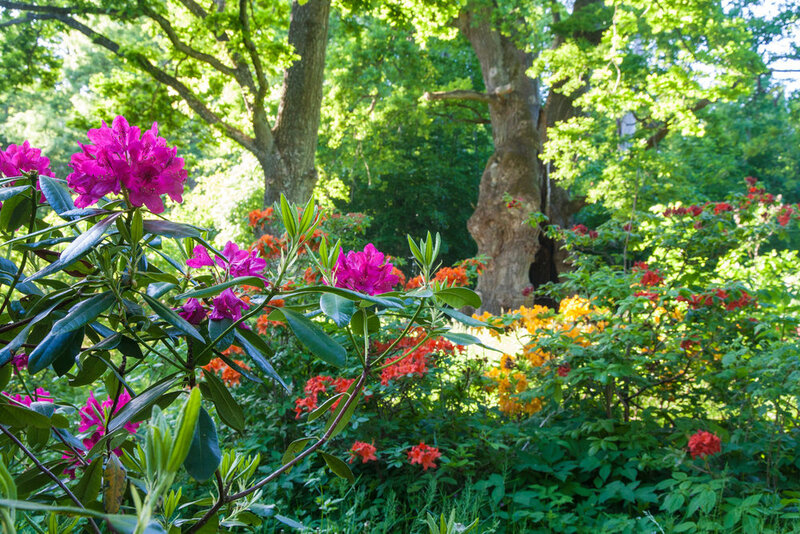 Shrubs, azaleas and rhododendrons are in bloom during spring and early summer on the slopes towards Ringsjön's beach. Medicinal and culinary herbs grow in the little herb garden, surrounded by high walls, roses, clematis and grapevines. The large English style perennials blend in all colors and heights on the Upper Terrace and reach their fullest splendor in late summer. In the park, six queens reside with their workers and drones. The honeybees are cared for by Bokeslundsgården and produce our own linden honey. Linden honey is flavorful with a hint of peppermint taste. The first roses start to show at the end of May. They bloom all the way into late autumn. Nepetan, "cat coin," forms a blue-grey frame around the flower beds in Rosengården. Here are the English roses from David Austin with incredible scents. Almost two hundred varieties of roses are available at Bosjökloster - thousands in number. Borrow a rowing boat at the pier for a ride on the lake. You can get your life jackets, oars and key at the entrance. Fishing licenses can be purchased in the fishery which is next door to Bosjökloster. Magnolias and other flowering shrubs bloom throughout Spring. Davidia involucrata, the ‘Handkerchief Tree’ or ‘Ghost Tree’, blooms in May. Climb in to the goats. The kids are usually up for some play. In the Court Yard, roses bloom among lavender, framed in by box hedges. Borrow a rowing boat – fetch vests, oars and keys in the entrance. Curious alpacas keep an eye on things - and visitors - in the park. In the Memorial Yard, you will find the Rose Stenchen, now renamed ‘Bosjökloster’. It has bloomed here since 1908. 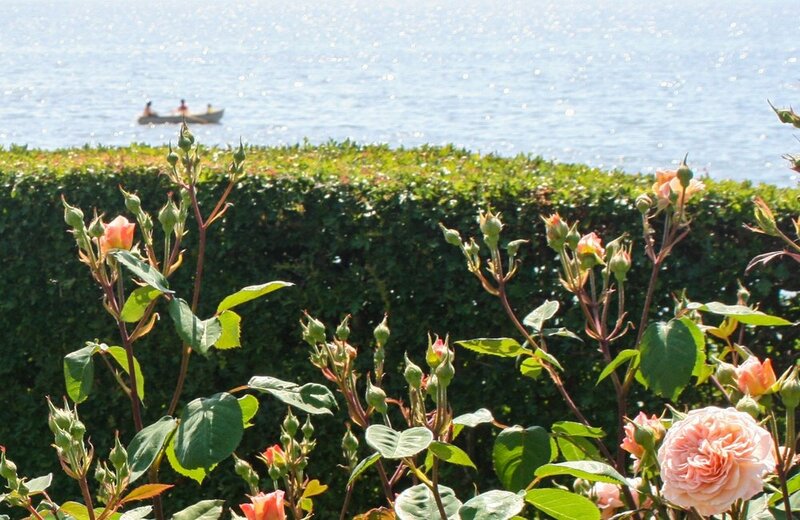 The Rose Garden boasts selections of English Austen Roses and Danish Old Roses. Hortensias in front of the ruins of the nuns’ Penitentiary Chapel. Enjoy the shifting seasons in the park. Bosjökloster is open all days all year.